Welcome to the Organ Pipe Cactus National Park Information Page. From the North: Follow AZ Hwy 85 through Ajo and Why. The Monument is 22 miles (35.4 km) south of Why. From the East: Follow AZ Hwy 86 to Why, then turn south on AZ Hwy 85. From the West: Follow I-8 to Gila Bend or I-10 to Buckeye, then turn south on AZ Hwy 85. From Mexico: Drive on Mexico Route 2 to Sonoyta, then north to Lukeville. There is currently no public transportation to the park. Check with private tour companies for guided bus tours that travel to Organ Pipe Cactus. The Sonoran Desert is home to many amazing creatures, all adapted to extreme temperatures and scarce water. While visiting the park, mammals you may encounter include the Mountain Lion, Mule Deer, White-tailed Deer, Desert Bighorn Sheep, Sonoran Pronghorn, Javelina, Lesser Long Nosed Bat, Coyote, Jackrabbit, Kangaroo Rat, and the Pack Rat. Pay special attention to the Sonoran Pronghorn – it is listed as critically endangered, and there are estimated to be fewer than 60 individuals remaining in the US. Other animals you may find include the Gila Monster, Quitobaquito pupfish and Western Diamondback Rattlesnake. Birders will be pleased that there are many local and migrating birds to see in the park, some of which are endemic to the region. Search for interesting birds such as the Gila Woodpecker, Costa’s hummingbird, Northern Cardinal, Cactus Wren, Curve-billed Thrasher, Black-tailed Gnatcatcher, Canyon Towhee, Black-throated Sparrow, Gambel’s Quail, Phainopepla, Cooper’s Hawk, Pyrrhaloxia, Varied Bunting, Lucy’s Warbler, Hooded and Scott’s Oriole, Ferruginous Pygmy Owl, Common Poorwill, Golden Eagle, Turkey Vulture, Caracara, and Zone-tailed Hawk. The Sonoran desert is much greener than most visitors expect, and full of cacti, desert succulents, trees, shrubs, and wildflowers. There are 28 species of cactus living in this region, including the Organ Pipe Cactus and the Giant Saguaro. Many of the columnar cacti such as these flower between May and July, with blooms opening in the cool evening to invite their bat pollinators. Spring is dominated by wildflowers such as gold poppies, blue lupines, and pink owl clover. Trees and shrubs provide an important shade resource in the desert to resting animals and germinating cactus seeds. Some of the interesting woody plants you can see at Organ Pipe Cactus are the Creosote, Brittle Bush, Jojoba, Palo Verde, Mesquite, Ironwood, Ocotillo, and the Elephant Tree. Check out what the Organ Pipe Cactus National Monument Visitor Center has to offer! Park Entrance Fees are $8.00 per vehicle for 7 days. All America the Beautiful passports are honored, as well as ORPI annual passes. The Kris Eggle Visitor Center is open every day 8am – 5pm except for federal holidays between April 1st and December 31st. Visitors may explore the park at any time, regardless of whether or not the visitor center is open. However, some campgrounds, roads, and trails are occasionally closed for maintenance, weather, or border safety concerns. Patio talks are held at the visitor center and cover various topics including the human history, ecology, and geology of the area. Evening programs are informational entertainment events held at the Twin Peaks Campground amphitheater. Ajo Mountain Van Tours are a winter offering, a great opportunity to visit some of the most scenic areas of the park. Space is limited, so reserve a seat early. Guided Hikes and Special Lectures are offered by local experts from time to time. Check at the visitor center for a current schedule. There are many many miles of roads open to bikers and hiking trails running through Organ Pipe Cactus National Monument. In addition to marked trails, map and compass off-trail hiking is fantastic for canyon exploration. Any roads open to cars are also open to bikes. One popular route is 21-mile-long Ajo Mountain Drive, with many scenic desert views. Puerto Blanco Drive provides a route to the Pinkley Peak Picnic Area, with interpretive signs along the way describing the ecology and culture of the Sonoran Desert. Bikers are advised to always be wary of drivers who may be distracted by the scenery around them and also to carry a secure lock if you plan to leave your bike for even a short amount of time anywhere in the park. Organ Pipe Cactus weather can be unpredictable, so always be ready for hot, cold, wet, and dry weather at any time of year. The following are typical weather patterns for the area. This is the busiest time of year at Organ Pipe Cactus. 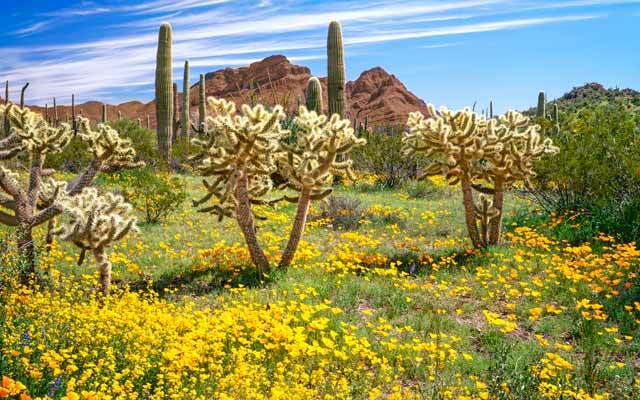 After a wet winter, visitors can enjoy lush displays of wildflowers popping out of the desert landscape. Weather tends to be relatively cool, with daytime temperatures averaging in the 60s F and nights going down to the 40s F, but never cold enough for snow or frost. Temperatures during the summer months tend to be extremely hot, reaching to the low 100s with humidity below 10%. Hiking during mid-day is not recommended. The end of July through September is the monsoon season, so be on the look out for fantastic cloud formations as well as dramatic lightning and thunderstorms!